We’d love your help. 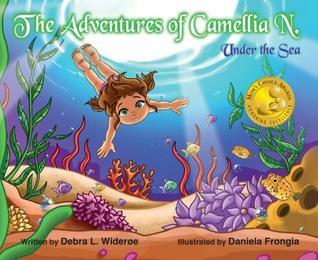 Let us know what’s wrong with this preview of The Adventures of Camellia N. Under The Sea by Debra Wideroe. The Adventures of Camellia N. “Under the Sea” (Mom's Choice Gold Seal for Excellence) is the second in a series of environmentally-focused educational storybooks targeted to early readers 5-9. Pint-size explorer, Camellia N.’s nightly dreams take her on adventures to all seven continents, under the sea and into space where she learns about and gains appreciation for the e The Adventures of Camellia N. “Under the Sea” (Mom's Choice Gold Seal for Excellence) is the second in a series of environmentally-focused educational storybooks targeted to early readers 5-9. Pint-size explorer, Camellia N.’s nightly dreams take her on adventures to all seven continents, under the sea and into space where she learns about and gains appreciation for the environment, wildlife and natural resources. “Under the Sea” explores the wonders of our blue planet as Camellia N. learns what makes the ocean one of the most important and mysterious habitats on Planet Earth. To ask other readers questions about The Adventures of Camellia N. Under The Sea, please sign up. Imagination, dreams, the power to create, the innovative ability to entertain oneself and to do so without the benefit of technology. In this fast-paced world of electronic entertainment, this is something that is quickly disappearing from the realm of young people. And, in so doing, they are missing out on so much. Camellia N. is not afraid to use her imagination. She loves to dream, to create and to entertain herself. And, in so doing, she is also opening her mind to a world of wonderful new t Imagination, dreams, the power to create, the innovative ability to entertain oneself and to do so without the benefit of technology. In this fast-paced world of electronic entertainment, this is something that is quickly disappearing from the realm of young people. And, in so doing, they are missing out on so much. Camellia N. is not afraid to use her imagination. She loves to dream, to create and to entertain herself. And, in so doing, she is also opening her mind to a world of wonderful new things to learn and appreciate. As her father tucks her into bed at night, he asks her if she’s ready for another adventure, as this is when Camellia N. has her most exciting and fascinating adventures: in her dreams. And, in these dreams, she learns so much about the world around her. Debra L. Wilderoe’s charming picture book story, “The Adventures of Camellia N.: Under the Sea”, is one in a series of entertaining and educational books for young readers. The story encourages readers to use their imagination, to dream, to create and to open their minds to learning more about the planet. In this book, Camellia N. takes the reader on an adventure under the sea, where she learns about so many fascinating creatures and sea life. With “a fish bowl on her head” to help her breathe underwater, and a yellow scooter, the little girl is well prepared for an adventure in her world of dreams. The illustrations, by Daniela Frongia, are colorful and really bring this story to life. Some key words throughout the story are written in bold and stand out, allowing the young reader to start recognizing new words. Fantastic book As an environmentalist, we need to educate our youth on the importance of preservation and conservation. The Adventures of Camellia N. Under the Sea sheds light on some of our ocean’s most endangered species and helps young children learn why we need to take care of them. I have no doubt this series will make a difference and help educate future generations of change leaders. The Adventures of Camellia N. “Under the Sea”, is a sharp sequel to, “The Arctic.” Again, the lead character Camellia N. takes any reader on an exciting and educational adventure. Camellia N. has really befriended adults and children readers with her intelligent and warming attitude. The writing is free and absorbing and clear-cut. The illustrations are engaging and the color schematics invite you onto each page. I’m very fond of the ocean so I appreciate this book with a deeper meaning. We need The Adventures of Camellia N. “Under the Sea”, is a sharp sequel to, “The Arctic.” Again, the lead character Camellia N. takes any reader on an exciting and educational adventure. Camellia N. has really befriended adults and children readers with her intelligent and warming attitude. The writing is free and absorbing and clear-cut. The illustrations are engaging and the color schematics invite you onto each page. I’m very fond of the ocean so I appreciate this book with a deeper meaning. We need to protect our seas. Oscar the boxfish and Commander Sophia were delightful docents and companions through the book. Debbie Wideroe has done a superior job with this 2nd book, she has allowed us all to imagine and learn and to take action. I think all fans are eager for the future books. “Under the Sea” is an outstanding book for young children. Debra Wideroe sends a strong message to her readers, not only about the environment, but about gender equality. I love that Camellia’s father tucks her in bed, and that the submarine Commander is a woman. I also love that Camellia is a fearless little girl curious about the world around her. The writing is as colorful as the illustrations and is suitable for every age. I highly recommend this book. As a diver, I am delighted to find a children's book that so elegantly emphasizes our effect on the underwater world. It inspires and sparks interest in sea life as Camellia meets endangered species such as hammerhead sharks and sea turtles. The book is fun for kids while also introducing them to environmental concerns. I would recommend it to all children who love our planet! The illustrations and overall story make this book an absolute joy to read! Camellia N.’s snarky personality, along with her curiosity and itch for adventure, takes your kids on a fun and educational ride. I ended up learning a couple things myself (ha ha). I can’t recommend this book enough! An avid reader, I wrote my first story when I was just six years old. I wrote every day for months with my tools of the trade, a #2 pencil and crayons!